Which Venom is your favorite? Ours is Eddie Brock. Sure, Mac Gargan was always the psychotically evil villain that a lot people wanted the Symbiote to be and Flash Thompson uses the suit to be a gun-wielding super soldier, but something about the original Eddie Brock tormenting Spider-Man seems classic. (And Red Hulk donning the Symbiote is just a bit too much, but to each their own). 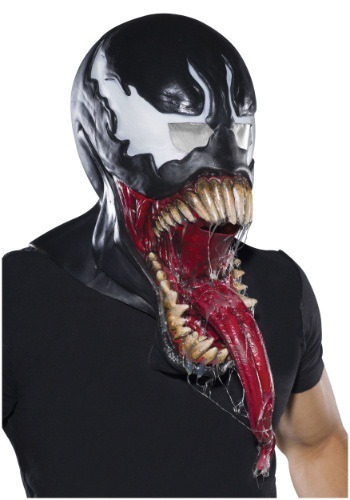 This Adult Deluxe Venom Latex Mask is somewhere between Brock and Gargan, so you can become your own complex version of the Marvel character. Peter Parker, Eddie Brock, Mac Gargan and Flash Thompson have all been hosts to the alien symbiote. It amplifies the desire for violence and hatred within its partner, driving its host to the bring of madness and transforming them into a hideous monster. Become Spiderman’s dark alter ego with this black-suited costume. This Marvel superhero outfit comes in two parts: a 100% lightweight polyester jumpsuit and a black face mask. The mask has nostril holes and netting eye patches, which provide clear visibility. The jumpsuit has a Spiderman logo located on the center of the chest and a Velcro closure in the back. Take part in the dark side of crime fighting with this superhero costume. He's ready to accept the dangerous Venom symbiote, because it will allow him to walk again after losing his legs in war. He knows he can only wear the suit for 48 hours at at time, or run the risk of being completely taken over by Venom. How will he manage? 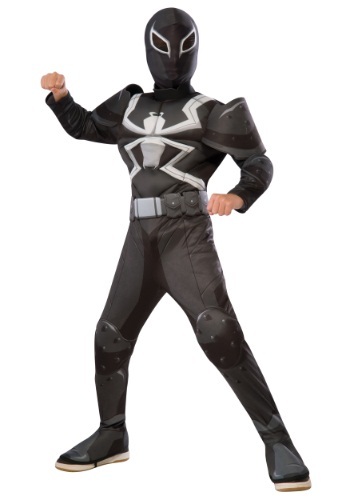 Your child can find out in this Child Deluxe Agent Venom Costume! Become infected with the Symbiotes virus in this Kids Muscle Chest Black Spiderman Costume, and dive into the dark side of crime fighting. Make Peter Parker face up to his dark side as his evil counterpart, Venom, and rival photographer Eddie Brock! You won’t have to decide between the classic Spiderman and dark Venom suits, because this Kids Reversible Spiderman Costume gives you both! One side is the familiar, classic blue and red Spiderman suit; but, turn it inside out, and it becomes Peter Parker's black doppelganger, Venom. Enjoy the light and dark side of crime-fighting in this reversible Spiderman costume! Symbiotes are hard to come by. It's not like you can just sit around, waiting for one to just magically fall off Spider-Man, so you can become his arch nemesis. (Okay, maybe Eddie Brock got lucky on that one, but it's not going to happen that way for most people). Instead, why don't you try this hoodie? It might not grant you any super powers, but you can still hate on Peter Parker while wearing it AND it has Venom's face embroidered on the front. It's probably the closest you'll get to being Spider-Man's main villain.